Around 4 weeks ago I began to take the GOPO Rosehip supplement to see if it helped with my long-term health condition of arthritis which I was diagnosed with at the age of 10. Having tried various treatments and supplements over the years I was not particularly hopeful and I was under no illusions. Different treatments can have a different impact on each individual person and arthritis can be affected by so many other variables too that I just didn't want to get my hopes up and yet I did want to give it a try in case it did help. I started by taking a dose of 3 GOPO tablets twice a day as recommended and at 3 weeks I reduced it to the maintenance dose of 2 tablets twice a day. I have kept a diary over this time to record anything significant or notable. For the first couple of weeks, there was nothing noticeably different. I was waking up each day with back pain and stiffness. Throughout the two weeks I had 'up and down' days as usual. It was at the beginning of week 3 that I noticed that I was waking up in the mornings with less back stiffness. By then the weather had been dry and warm for several weeks too which also has a positive effect on my arthritis. I managed a shopping trip at the shopping centre that week which can often be problematic. I also noticed a little mid-cycle bleeding and I wondered whether that could be linked to taking the GOPO supplement. A quick phone call to my GP reassured me that it was more likely to have been caused by stress and unlikely to be linked to taking GOPO. The GP was really pleased for me to keep taking the supplements especially when I told him that I had noticed a positive effect. We then had a few days away and that was a real test. I had some pain and stiffness during and after the car journey there (it was several hours in the car so that was to be expected). We've often had to cut our holidays short and return home a day or two early because of my back pain worsening by not sleeping on my own orthopedic bed. Thankfully this time it didn't get so bad to have to return home early. I had one particularly bad day when the strong painkillers came out but the rest of the time things were relatively settled. Week 4 has been another week of glorious weather. Very dry and very sunny. I had a bad day of hip pain the day after travelling back from our few days away which was probably a consequence of the long journey back the day before. I managed a spot of gardening this week too which has been a bit of a rarity lately. I also saw an arthritis specialist that I'd been waiting to see for the past couple of months. From the X-ray it appeared like there is some damage to the top part of the pelvis in addition to the previous damage to the actual hip socket. That could be the culprit for why the back pain has been getting worse over the past year or two. He asked for further blood tests and investigations, so I should know more next time I see him. Less pain equals happier mummy. So whilst I've had a positive time with my arthritis over the past couple of weeks, we've got some not-so-good news about 8 year old D. He has been experiencing the odd episode of hip pain over the past few months. My rheumatologist strongly urged us to get him referred. Based on my history (my arthritis began at a similar age), they are concerned that it is likely to be arthritis in his case. These days there are apparently ways of preventing so much damage being caused to the hip joint and so we are hoping that early referral will prevent things getting really bad for D should it be confirmed as Arthritis. Needless to say, I'm continuing with taking the GOPO supplements and I'll be giving another update on how I'm getting on in a few weeks time. Disclosure: I have sent a 12 week supply of GOPO to trial and review. Like all Nintendo 3DS games, the Pokemon Art Academy can also be played on the Nintendo 2DS which is great news for us. This is essentially a drawing game designed to help you learn how to draw various Pokemon characters. The kids have really been getting into it and after a couple of days of playing it, J wrote his own review on his own blog. As an avid Pokemon fan, 8 year old D said 'this is just what I needed'. He is often drawing Pokemon on paper but ends up having to try and trace pictures from his Pokemon annual which he finds frustrating at times as it can be tricky. Lessons - which give you step by step instructions on how to draw the Pokemon characters. Free Paint- where you choose a character and draw it using the Art academy tools but without any guidance and no starting point. Quick Sketch - this does provide a faint outline of the core shape of the character as a starting point which you can then trace over, add colour to and add the specific details and features. Once you have completed a set of lessons by completing a set of characters and saving them on your progress, you can then complete the Novice Finale drawing using all the skills and knowledge you've learnt and then progress onto the next set of pictures. There are plenty to get through so you'll never get bored! The really great thing about games like these is that it can really help build confidence in children who may think they are not very good a drawing or art. They can learn in a clear, easy way how to produce some pretty amazing looking pictures. Whatsmore, these pictures are of some of their favourite characters that they are already familiar with if they love Pokemon. "Mine and D's Oshawott are really similar" said 10 year old J which shows that the game really does help get the pictures looking really good with the step by step instructions. Both 8 year old D and 10 year old J loved the Pokemon Art Academy and I don't think it will be too long before Miss T joins in the fun as it seems she's already become a bit of a Pokemon fan already! Disclosure: We were sent a code for a copy of the Pokemon Art Academy for Nintendo 3DS for the purposes of review. All opinions are our own. Once upon a time, there was a family who had the tiniest kitchen ever. I've tried to find some photos to show you but it was so small that we could not even take any photos in there. This family ended up eating unhealthy food and lots of takeaways because their kitchen was too small to cook in. Whenever they had friends around for dinner, people would always comment on just how small their kitchen was. At the end of the meal, offers of help would come to help stack the dishwasher. Embarrassed, I would tell them that I was the dishwasher. There was no space at all to have an actual dishwasher put in. We knew something needed to be done and after many years of struggling in our tiny kitchen, we decided to have a house extension giving us a bigger and more usable kitchen. I finally had space to actually cook! We also got a dishwasher for the first time and whenever we have guests to dinner, I whisper a thank you to my dishwasher as I wonder how I managed so long without one. It was big enough for J to do his Occupational Therapy excercises in. It was big enough to have teddy bear picnics on the floor. 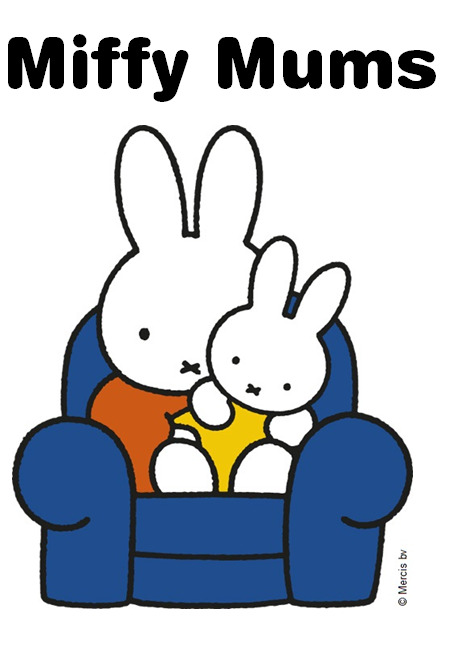 It meant that when Miss T was born, I was able to keep an eye on her whilst being in the kitchen (there was no way a highchair could have fitted in our old kitchen). It faces the garden so I can keep an eye on these three even when I am indoors and they are outside. And it truly has become the place where we can all 'hang-out' - the kids can sit at the dining table which now fits in our kitchen, and play board games or school work or just chat with me whilst I am doing chores or cooking. And we even decided to keep hold of our old dining table which was dented and stained but makes a perfect art and craft table. Our new kitchen meant that I could finally have a decent sized fridge rather than the teeny under-the-counter one I had before which saves oodles of time not having to pop to the shop to buy milk daily because more than a couple of pints each day just wouldn't fit in the old fridge. Of course the fridge has to have the alphabet fridge magnets which seem to be oligatory once you have kids in the house. And it doubles up as a bit of an art gallery too. One of my favourite things I keep on my fridge is a letter from J after he / we had a difficult day. I now also have space for a few kitchen gadgets from really simple things like my bright yellow lemon squeezer. To a bread maker which makes tasty loaves of bread that get demolished by the whole family in minutes. And my Kenwood Chef mixer which I honestly don't know how I managed without as it makes whisking, mixing and kneading a breeze. Although I often have plenty of helpers on hand to help with the mixing anyway as it is Miss T's favourite job in the kitchen. Our kitchen has also enabled D's passion for cooking to blossom as we've been able to take photos of him cooking for his blog, The Brilliant Chef, and even make recipe videos of him. None of which could have been done in the old kitchen as it really was too small to even take photos. We have a few little touches that make out kitchen our own like growing a few herbs on the windowsill. The windowsill also acts as a practical area for keeping things like paints and bubble wands to hand for me to get out for the kids. A quirky elephant fruit-bowl which granny gave us from her travels is a great way of keeping plenty of fresh fruit ready for the kids to munch on when they need a healthy snack. Our new kitchen has revolutionised mealtimes, as I have the space to cook, lay the table, and just want to spend time in my kitchen. We can enjoy simple summer seasonal favourites without it becoming a stressful squeeze in the kitchen. We weren't quick enough to get a sample of Fairy Platinum Dishwasher tablets but bought our own to try as we love and trust the Fairy brand so much already. Whilst I have Fairy to help with the dishes, I have another little helper to help me clean the floors by tying rags to his feet and sliding around the kitchen. I hope you can see just how important our kitchen is to us and why it has truly become the heart of our home. 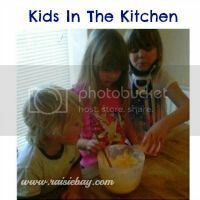 “This post is an entry for the “My Kitchen Story” Linky Challenge, sponsored by Fairy Platinum” . You can find Fairy on facebook at Facebook.com/fairydish. 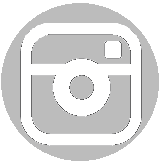 And you can find out more about #Kitchentales over on Britmums here. Miss T is a real daddy's girl often asking daddy for cuddles, telling daddy that he's cute and that he's got "pretty knees" (yes that does say pretty knees). One of Miss T's favourite activities to do is 'play plus plus' and she loves nothing better than playing plus plus with daddy. Miss T will call out different things that she wants daddy to make ranging from chocolate, dogs, horses, ice cream and so on. The great thing about Plus Plus is that it is so versatile that you can have a go at making pretty much anything, the only limit being your imagination. The latest favourite way of playing with Plus Plus is for daddy and Miss T to build up wooden blocks into a tower with Plus Plus pieces hidden inside. She then loves to knock down the tower to find the Plus Plus. Very exciting and lots of fun. When we first received a pack of Plus Plus from The Toadstool, we wrote a review as it had so many advantages and both J and D loved playing with it. Miss T got extremely excited to find more Plus Plus under the tree at Christmas. But the real test of just how great it is is how well it has stood the test of time and maintained the children's interest. Some toys will engage and excite the children at the start. Sometimes for a couple of weeks. Occasionally even longer than that but Plus Plus continues to be a great toy for them to play with nearly a year on from when we originally got it. And there's still no sign of them losing interest. If you're a Plus Plus fan already, you can get updates from the Plus Plus UK facebook page here or keep an eye on The Toadstool for updates on the Plus Plus range. Pretty much everyone who has ever read this blog will know that we are HUGE Moshi Monsters fans in this family! J's preferred birthday theme each year for as long as I can remember is Moshi and so this year, the year he turned 10 (!!! ), was no different. 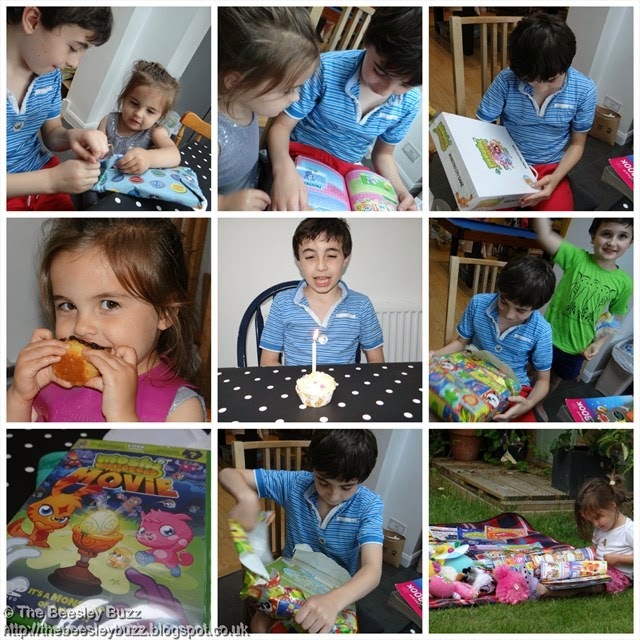 It was Moshi cake and Moshi presents galore! Despite seeing the Moshi Movie at a special premiere event last December, J was delighted to get Moshi Monsters: The Movie on DVD. He plans to work at Moshi HQ one day and is already planning the plots for future Moshi movies. We also bought him the Monstro City Board game which is really well thought through and is great fun to play. Miss T didn't miss out on the birthday excitement as we gave her a Talking Poppet so that she got to unwrap something too. Instead of a whole moshi-themed birthday cake like last year, The Brilliant Chef and his little assistant made lots of cupcakes for J's birthday. They added Moshling figures on top as J adores Moshlings! We used Pudsey cake cases as you might remember that J loves Pudsey bear. The cakes are really simple to make, just mix together 125g of plain flour, 125g caster sugar, 2 eggs, a teaspoon of vanilla extract, and 125g butter or margarine. Then they just need around 15 -18 minutes in an oven pre-heated to 180C. 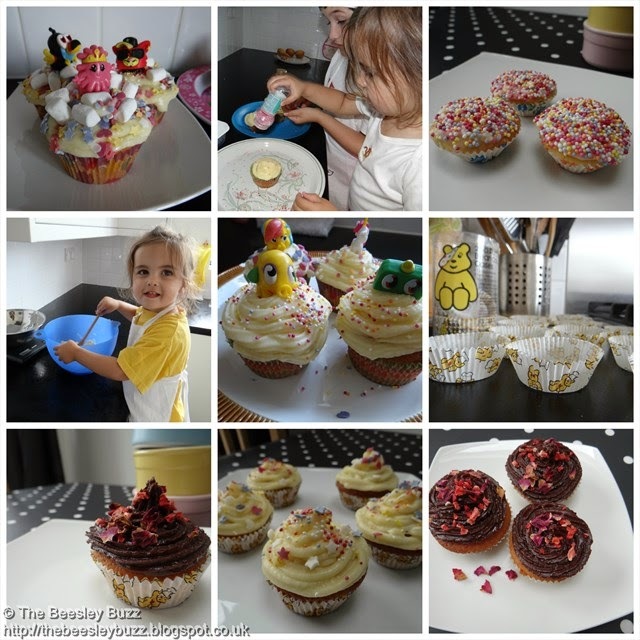 I had a go at piping the frosting after seeing this blog post from A Mummy too. We tried both the piping method and the spoon and dip method. I think I need a fair bit more practice though as my icing never turns out too well. The icing that looks like chocolate frosting is actually a healthy frosting recipe I found on Chocolate-Covered Katie. Anyone who likes peanut butter will love these but if you don't like peanut butter then steer clear. Happy Birthday tenth birthday Joshi Moshi! So proud of you and love you so so much!!!! I had wanted to fit this recipe in my 'Things I discovered' post but I ended up singing the praises of Evo3 Extra Virgin Organic Olive Oil so much that I ran out of time. So here it is instead. I never knew that making ciabatta was so simple. After seeing the attempts on Bake Off making various doughs- remembering that ciabatta was a 'wet dough' and needed lots of 'holes' in it once baked; Remembering the horror of Catherine's face in 2012 bake off when her dough (not ciabatta dough but still dough nonetheless) ended up on the floor and led to that now famous quote about "not serving Mary Berry green carpet!" I had never even contemplated attempting such a thing until a few weeks when I got a craving for some ciabatta and thought I'd just give it a go and see what happened. Turned out to be really simple to make and turns out amazing every time. We went on to make it again the day after and the day after that and several times since. Be warned, like most fresh bread, this is extremely moreish warm out the oven so you will end up eating it in one go! Tastes great when made using the Evo3 Extra Virgin Olive Oil (although that tastes so great that it feels a crime to use it in cooking!) and tastes great dipped into the olive oil too to eat. 2. I used a mixer with a dough hook to mix the flour, sugar and yeast, then added the water and salt. You could do this by hand if you don't have a mixer. Remember ciabatta is a really wet dough so it will look sticky and wet. 3. Then oil a surface with olive oil and oil your hands. This is to stop the dough from sticking. Using oil instead of flour helps because it is a wet dough and using flour would get absorbed into it and dry it out too much. 4. Next you need to 'knead' the dough with lots of stretching and slapping down movements. I did lots of scooping part of it up in my hands then slapping it down. You are trying to make lots of lovely air pockets in it by doing this. 5. Grease a bowl with a little olive oil and place the dough in it adding a little more oil on top of the dough. 6. Cover with cling film and leave to rise for around an hour. You are looking for it to roughly double in size. 7. Flour a baking tray well and oil a work surface with olive oil. Then tip the dough onto your oiled work surface. It will sort of spread out. With oiled hands, lift half of it and fold it lengthways onto itself. This should look like a ciabatta-ish shape but still quite floppy. 8. Now lift the dough onto your well-floured baking tray and bake in the oven for around 30-35 minutes at 190C. Lifting the dough onto the baking tray can be a bit tricky because it is so floppy so keep the baking tray close by and try to move the dough quickly across. I oiled my hands before doing this too, to stop it sticking to me. This is it 'folded' in half lengthways. It still looks flat and floppy. Mario Kart Challenge 3: Which character are you?